The first Monday of every month, I'm selecting a feminist, business, or self-help book to review for the following month. And, rest assured — if I'm featuring it — there’s something you oughta know! I recently took a flight to Washington to help my mom move, and I packed this book with me to read. However, instead of reading, I prepared and created my entire presentation that I had that coming week (coaching program). And what would typically take me a week to craft only took me 2-3 hours because I was able to practice deep work (not the norm for me). It was like just having the book in my bag was teaching me by osmosis! Photo credit: moi. 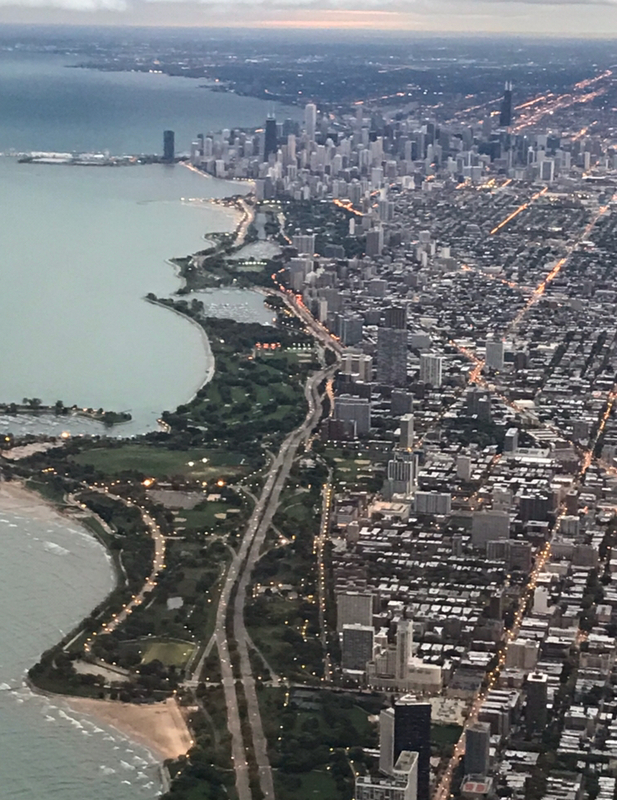 On said flight ^ back to Chicago. I needed a place to post this, okay? This picture is validating to every person that lives in this incredible city. "I intuitively have known this my whole life — that people want a million things from you, and the answer to almost everything, if you truly want to spend the time you have on this earth unlocking your hidden treasures that only you have to offer, should be "NO." I hate wasting time, especially fake productive time that seems useful because you're not watching TV, but in reality is not getting you closer to your goals and is just a way to pacify your need to feel productive. I'd rather watch TV than do fake productive time." 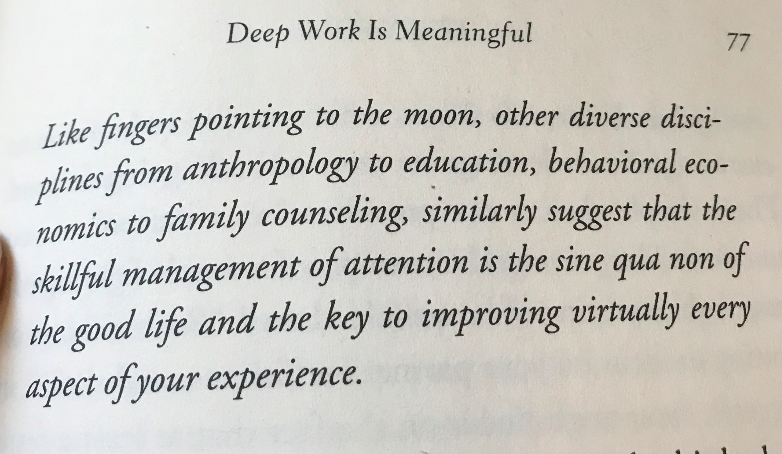 "...deep work is hard and shallow work is easier..."
"... the skillful management of attention..." Quote from nonfiction writer Winifred Gallagher after receiving a cancer diagnosis and deciding to live her life the way she wanted and not give time to fear and pity. Have you read Flow: The Psychology of Optimal Experience ? I highly recommend it. I've felt this sensation while swimming, playing instruments, meditation and skiing. I’ve also experienced flow while writing, working with people 1:1 and creating workshops. With an Urban Planning degree and experience in architecture, I couldn't help but nerd out on this Eudaimonia Machine designed by David Dewane space where you can conceptually and physically achieve deep work by first going through a gallery (to inspire), then a salon (to converse), then a library (to research), then a cafe (to ruminate), and finally arriving at the deep work chambers where you can process all of the information and be uninterrupted to actually analyze and do something with it. Instead, we're in office environments, co-working spaces, or cafes where we're constantly interrupted and distracted. But we can create these spaces for ourselves! You can find a routine and rituals that work best for you. Maybe, if you're brave, it's to go without internet connection all together (Aziz did it). Or, maybe, you simply schedule your deep work sessions at the beginning of each week. Just replace "Twitter" with "Instagram," and I couldn't agree more. I'm now finding myself having to actually delete my Instagram app daily so I'm not tempted to push the instant gratification button. It actually helps me to get work done and to be the human I want to be... and maybe feed my children (I need more help than just deleting social media from my phone for that). I finished this book feeling inspired to find more depth in my work. I've started finding more quiet spaces to work from and setting more boundaries around my social media and email use. Here's to more depth in our work! Frankly, this book was a bit repetitive, which made it difficult to get through. I’d still recommend Deep Work to anyone who needs validation to quit social media or is wanting to endeavor a deeper work practice. Now, for your thoughts! If you’ve read Deep Work, what would you rate it? Do you agree or disagree with anything the book has to say? Have a book suggestion? Let us know in the comments section below!